Its a party! Cheese, chocolate and fruits! Dip whatever you want and whatever you got into a steaming hot bowl of oil, cheese or chocolate! 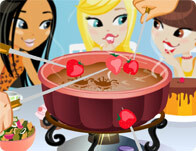 Everyone loves a fun Fondue Party!